Thomas Robert Bugeaud, marquis de la Piconnerie, duc d'Isly, was born 15 October 1784 in Limoges, France. After running away from homed at a young age, Bugeand spent several years as an agricultural worker before enlisting as a private solider in the Imperial Guard at the age of 20. Interestingly these seemingly disparate vocations gradually became more and more entwined during the course of his life. Over the next eleven years Bugeaud quickly rose through the military ranks, distinguishing himself in Poland, Spain, and the Alps. Indeed, by 1815 he had achieved the rank of colonel and he was involved in Napoleon's restoration during the Hundred Days (20 March 1815 - 8 July 1815, a period of actually 111 days). The restoration culminated in Napoleon's defeat at Waterloo, and his return to exile. Now out of work, Bugeand returned to his home district of Périgord where he returned once again to agriculture. But the call of the military could not be silenced. The call came in the form of the July Revolution in 1830. Again, he excelled, and by 1831 he was given the rank maréchal de camp, which was basically third in command of the French army. It is during this period of his life that his aggressive - perhaps dark - side began to assert itself more prominently. In 1831 he was elected into the Chamber of Deputies. In this position he made his opposition to democracy very clear. He was brutal in his policing of the city, especially so in the suppression of revolts by the people. In fact, his brutality while working as a goaler led to a duel between himself and his deputy. His deputy was killed in this duel. Then he was sent to Africa to conquer Algeria. Although initially against this idea, he accepted the challenge and set about subjugating Algeria with ruthless efficiency. His level of violence seems to have been extreme. He was so successful that by 1840 he was governor-general of Algeria. Further success in Algeria strengthened France's position there. And in 1843, Bugeand was elevated to the role of Marshal of France. But it was perhaps his victory at the Battle of Isly on 14 August 1844 that was his most memorable. He even won another title - duc d'Isly. On 20 November 1944 France issued a stamp commemorating the Centenary of the Battle of Isly. 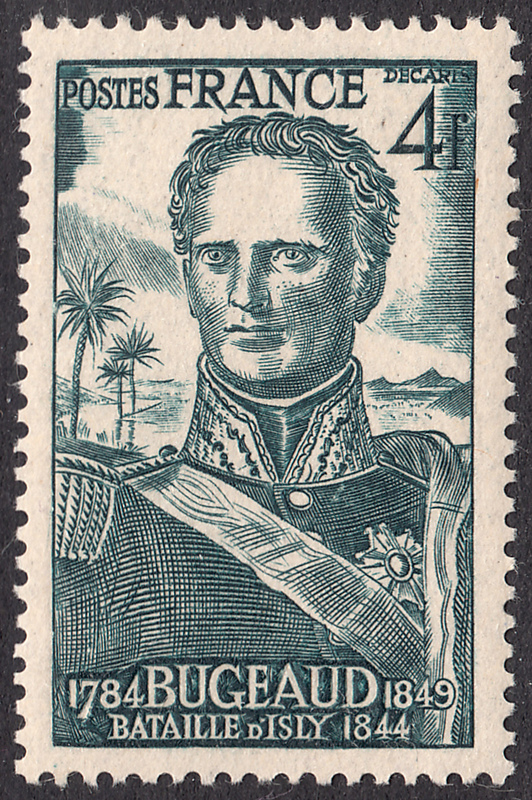 This stamp was designed and engraved by Albert Decaris. The stamp features the portrait of Thomas Robert Bugeaud. What I see in his design is a young man gazing proudly towards the future. Perhaps here we see an attempt to restore pride in France's military history during a period of immense turmoil in the country. I find the choice of subject a bit ironic, but engaging in personal political opinion is beyond the scope of this humble blog. Speaking of the engraving itself, it is another fine example of Decaris' personal take on portraits. Great presentation and great comment as always. Thanks!